Get Fit, Now! will help you get fit and stay healthy! is to help you get into the best shape of your life. We believe that anyone can get healthy and fit with a regular program of exercise and good nutrition. Are you ready to enjoy better health, higher energy levels, and physical wellness? Our fitness classes are designed to help people of all ages, sizes, and fitness levels to attain well-being, strength, and relaxation. Drop by anytime to see our facilities and learn more about the classes we offer - you can contact us here. Our instructors are experienced, fun to work with, and completely professional. Their goal, is your goal, to help you reach a new level of fitness, well-being and strength. Come Meet the Team, ask questions, and get ready to start working on the new you. We all hope to see you soon! Want to sneak in a quick Zumba! class? 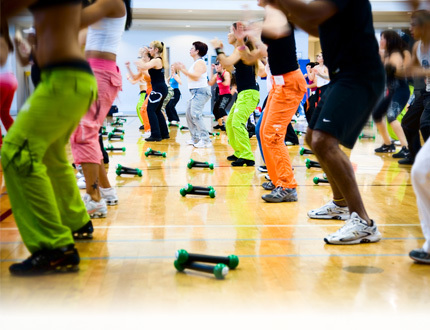 How about a good Zumba Step Class? Or Kickboxing? See our Class Schedule for days and times. Subject to change w/o notice. Get Fit, Now! is excited to offer you these great promotional offers! Visit our Promotions page for more information.